The Hispanic Association of Colleges and Universities and Southwest Airlines have announced applications are being accepted from college student through April 30, 2019, for the 15th Annual ¡Lánzate! / Take Off! Travel Program. 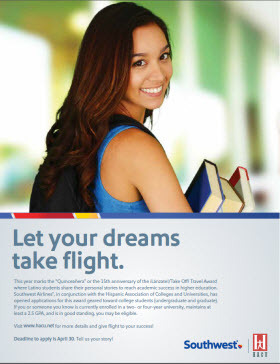 HACU and Southwest Airlines will award roundtrip e-pass(es) to undergraduate and graduate students across the country who travel at least 200 miles from home to pursue a higher education and meet the eligibility criteria. An essay is required. Students selected receive e-pass(es) for use to travel between home and college or university. To read detailed guidelines, eligibility requirements and apply online, click here. Download a PDF Poster here. Help us spread the word on your campus.